Saturday, June 26, 2010 on the square at Soren Kierkegaards Plads by the Copenhagen harbour. There are 5 different races to register for. All races take place on the same track and involve racing with varying loads. Registration is only available online. It costs 50 kroner [ca. $10] per person per category. 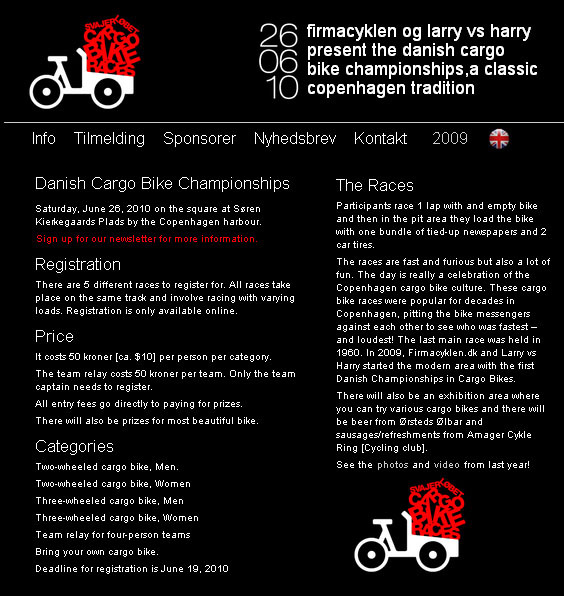 The team relay costs 50 kroner per team. Only the team captain needs to register. All entry fees go directly to paying for prizes. There will also be prizes for most beautiful bike. Bring your own cargo bike. 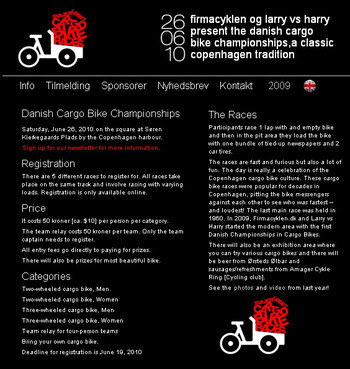 Deadline for registration is June 19, 2010 "